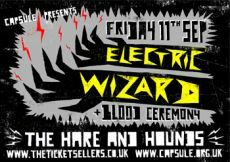 Capsule’s first gig after Supersonic Festival will be the mighty and monstrous Electric Wizard with support from Blood Ceremony. A great way to kick things off after the summer and you seem to agree as all tickets online and in the shops have SOLD OUT! A few tickets will be kept on the door so anyone without one should get to the venue early.